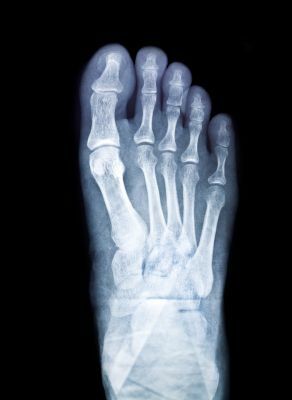 Stress Fractures in Feet | Podiatry Associates, P.C. You don’t stand on cracked ice, or put your full weight onto split floorboards over a hole. When something is cracked, it can’t hold the weight and pressure it was designed to support. The same is true for your bones. A stress fracture is a thin but compromising crack in bones that hold you up. Stress fractures in the feet are not traumatic injuries like normal, full breaks. Rather than a sudden force splitting a bone, these thin cracks develop over time. They’re created when the feet struggle to absorb repeated hard impacts. Normally your muscles help absorb and disperse the shock. When your lower limbs are overworked, however, they aren’t able to handle impacts as well as they should. This can happen when you train improperly, wear the wrong footwear, or have biomechanical issues. The repetitive, hard pounding stresses the bones in your feet. Eventually one or more of the bones can develop thin cracks from the strain. These splits usually don’t go all the way through the bone, but they do weaken whichever structure they affect, whether it’s your arch, heel, or even your ankle. A stress fracture in one of the metatarsals is the most common kind. No matter where the split might be, the pain that results tends to grow worse the more pressure you put on your foot. Eventually, it can be debilitating and keep you from participating in many activities. Allowing the problem to progress too far also puts you at high risk for a full break. Treating a stress fracture does take time, but it’s better than waiting for your foot to break completely. You’ll need to have the condition correctly diagnosed to rule out other possible issues. Dr. Cynthia Oberholtzer-Classen and the team will carefully examine your lower limbs. Most likely our staff will use some kind of diagnostic images to confirm the condition. Then we can plan out your recovery. The most important step will be to rest. Continued pressure on the affected foot makes the crack worse, so you’ll need to stop all strenuous activities and reduce the pressure on your lower limbs. This can mean wearing a special walking boot or even a cast. As the affected foot heals, you’ll be able to participate in low-impact sports like swimming or biking to stay active. After the bones have completely recovered, you’ll slowly get back into your higher impact activities. Taking time to recondition your feet is important to avoid re-injuring yourself right away. If you can avoid the strain of stress fractures in the feet altogether, it’s better for you. A little preventative care can go a long way. Always wear supportive shoes that are designed for your sports or daily life. When you start a new exercise program, begin slowly and increase your intensity and endurance over time to give your feet a chance to adjust. Stretch and strengthen your feet regularly. Also, always remember to warm up and cool down properly when exercising. A stress fracture can put you out of commission for a while, but it doesn’t have to keep you down. Take care of it properly and you’ll be back on your feet in no time. Let our team at Podiatry Associates, P.C. help you give your lower limbs the best care possible. Use our online form or call (303) 805-5156 to make an appointment with our team.